Offering you a profitable Taxi Booking Solution with the implementation of advanced techniques. In this hustle-bustle lives, everyone is relied on the doorstep services and prefer to book the service via their smartphones. Even now people book cab services like Uber and Ola via their mobile phones and it gave rise to the demand of Taxi app development company. As it enhances the riding experience of customers while implementation of the advanced techniques. The rise of taxi booking app for the Android and iPhone gave rise to the cab software development. Synarion IT is the leading taxi booking app development company, offers readymade and customized solution to the customers. We have a melange of highly skilled and professional taxi app developers. Our team delivers enrich feature and highly functional mobile taxi app for Android and iPhone to our customers as per their desires. Customers can make their profile with basic details such as name, contact number, Address etc. And, they can modify the account details anytime. User can book the cab immediately, and ride for the shorter distance. In a few minutes, the cab service will be provided on their doorstep. With the help of Online Taxi booking software, user can pay the amount of taxi app service online by different payment mode such as paytm, Google Pay etc. Customer can schedule the ride for their future date and time. So, at that time they don’t face any hassle. To send and receive confirmation, it is essential to send the OTP on the verified Mobile number. Via Push notification, SMS, Email, passengers are able to get the real-time updates like driver to arrive, booking of a cab. User can have an idea of the fare of their ride, they can have a calculation of their pick up and drop location. User can get the updation of their trips online via Push Notification, SMS and Email etc. Users can have a discount on the taxi service by giving the promo codes while booking the ride. Unique referral rewards can be earned by the user by referring the app to the friends and family. User can contact the driver to coordinate for their pickups. View all the last and upcoming rides on the taxi mobile app. Users can book the cab facility for others also for their friends and family. Driver can easily register to the panel, they only have to submit the documents and basic details. User can get the new request by the notification and get alert for the new order. Drivers have full authority to mark themselves available for the service. They can prefer the online/offline mode. Taxi app drivers can accept and reject ride according to their preference. Driver can contact the passengers directly to inquire about the trip. Driver handles the start and end of the trip. Driver can view and track the history of the rides with the amount. Submit review and ratings of the customers, they can tell about the experience of the trip. Admin secures the details of the user and driver, name, address, contact info. Drivers workflow has been managed by the Admin, as to sign up of driver, review, and rating etc. View and track of drive and provide the accurate location on the map is done by the admin. Admin manage all the registered details and workflow of the customers in the proper manner. The details of vehicles are managed by the admin for the security purpose. Admin uses to manage and add the categories which will be integrated into the app. Admin manages the commission of the drivers and pays them on time. Refunds to the customer and driver of the taxi app are managed by the admin. SMS Setting can be enabled/disabled for the customers as per their preference. How Taxi Booking App Panel Works? We offer readymade Solution to our customers, as it saves time and cost. 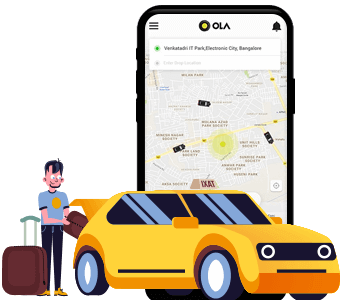 Our readymade solution is the clone of Ola, Uber, Lyft, Lynda. Synonrion IT, Taxi Booking Readymade Solution has all the advanced feature to the basic module. Hence we offer Uber Clone, Ola Clone and Lyft clone Script. We provide Taxi Booking Solution including web and app, with advanced features to our client’s to grow the taxi business. With our expertise team implement the advanced technologies and bring your high functional Taxi Dispatch Software and take your taxi booking business to the next level. Synarion IT helps enterprises to grow by implementing the advanced technologies and features to the cab management system. 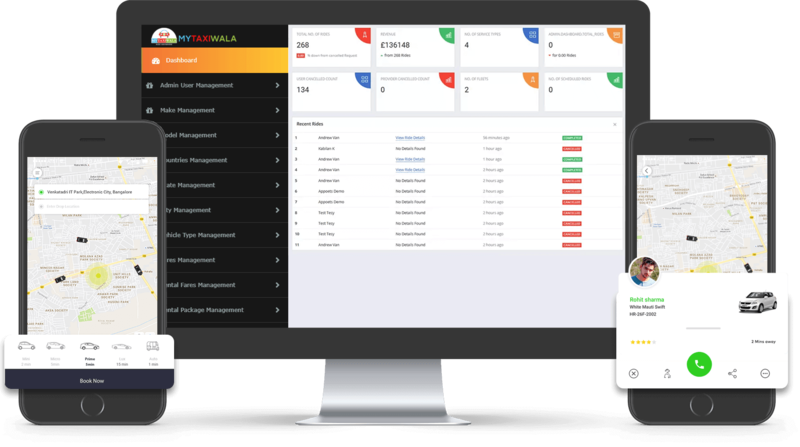 Why Choose us for Taxi Dispatch Software? There are various reasons to opt for a Taxi Management Software Development Solution. We are always available for your support, our customers can contact us at any time and from anywhere. We have experienced dedicated team, who put their high efforts to bring the best outcome. Synarion IT keeps all the details confidential and secure. Our team is well versed in their profession and have delivered several taxi mobile applications. The main reason to opt us as we deliver readymade and customised Taxi Management Software to our client’s. Our taxi booking services are based on Uber like app source code which helps to save time and reduce cost.